South Korea reported one of the lower levels of life satisfaction among member countries of the Organization for Economic Cooperation and Development, a recent report showed. 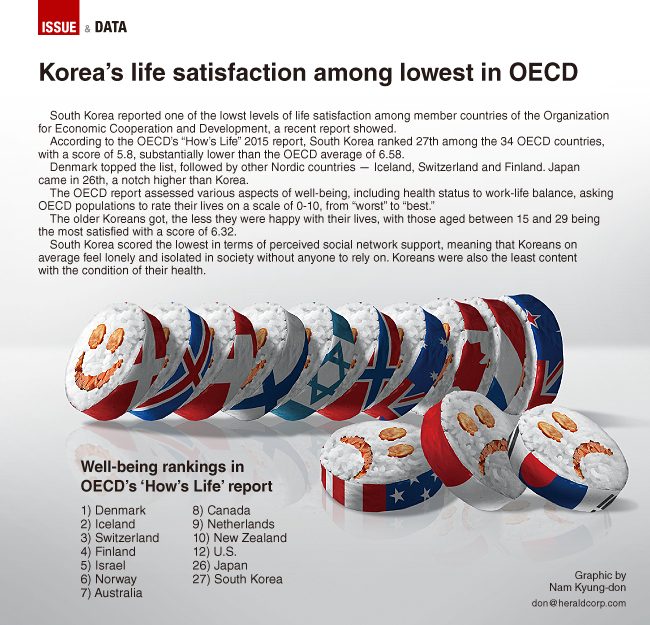 According to the OECD’s How‘s Life 2015 report, South Korea ranked 27th among the 34 OECD countries, with a score of 5.8, substantially lower than the OECD average of 6.58. Denmark topped the list, followed by other Nordic countries -- Iceland, Switzerland and Finland. Japan came in 26th, a notch higher than Korea. The older Koreans got, the less they were happy with their lives, with those aged between 15 and 29 being the most satisfied with a score of 6.32. South Korea scored the lowest in terms of perceived social network support, meaning that Koreans on average feel lonely and isolated in society without anyone to rely on. Koreans were also the least content with their health status. But Asia’s No. 4 economy saw an increase of 12.3 percent in its household income between 2010 and 2013, the biggest jump in the OECD bloc, with its job security and housing affordability being comparatively high. It also had the lowest long-term unemployment rate in the OECD.